What to do with all that extra Halloween candy…..
Last night’s trick-or-treater attendance was rather lacking. We are left with tons and tons of candy! Instead of picking at it little by little over the next few weeks, I decided to make an actual dessert with our candy. 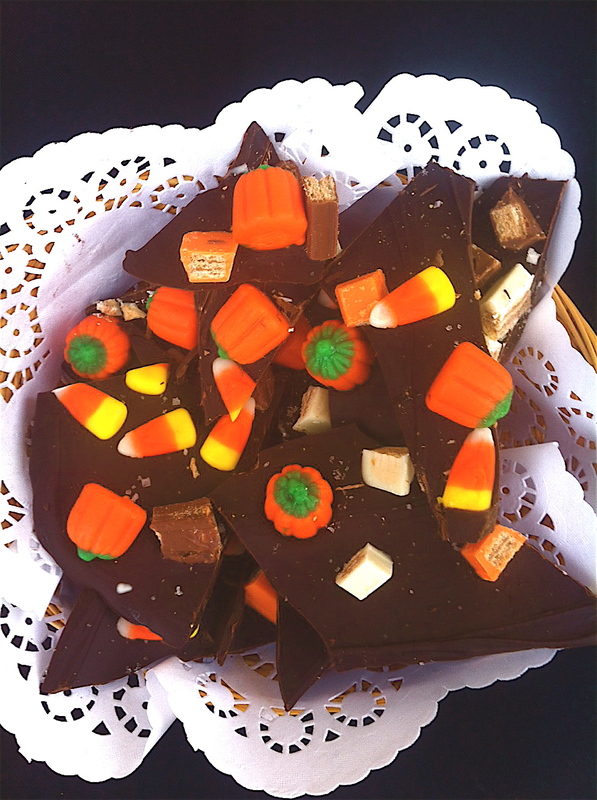 This recipe for Halloween Bark is really easy… just three ingredients and your extra Halloween candy. You can serve it for dessert with friends in the few days or package it up in cellophane bags and send it as gifts for teachers, the mail man, etc… It’s a cute little way to start the spirit of holiday giving with ingredients that you already have in your kitchen. Heat a double boiler with 2 inches of water to a simmer. Melt the two chocolates in the double boiler, stirring constantly so that it doesn’t stick to the bottom of the pot. Remove the chocolate from the heat and stir in the almond and vanilla extract. *If you want to make adult bark, you can substitute the almond extract for cointreau or any other flavored liqueur. Lay a piece of parchment paper on top of a large cookie sheet. Spread the chocolate with a spatula into an even layer; it should take up nearly the whole sheet. Sprinkle the chopped candy across the top of the chocolate. Sprinkle some sea salt across the top- this adds a nice saltiness and brings out the vanilla and almond in the chocolate. Let the chocolate sit for two hours, or until firm. You can speed the process by placing it in the refrigerator. Remove the chocolate and parchment from the cookie sheet. Cut the bark into large pieces. Serve as a dessert or tie in cellophane bags as gifts.